No two A/B tests are the same: estimate the appropriate duration and significance level for each A/B test you run and maximize your testing ROI (costs versus benefits ratio). A must have tool for A/B testing professionals. Use it now: Sign In or Start Free Trial. Ever wondered how long you should run a test, so that you find the sweet spot between releasing poorly tested variants and delaying good changes, between missing true winners and quick testing? Have you considered that the significance levels you use may be too risk-averse? With our comprehensive risk/reward model you can estimate the ratio between costs and benefits to find the sweet spot in which you run tests just as long as needed, and with just as much scrutiny as needed to achieve the best possible long-term ROI from your conversion optimization or landing page optimization optimization efforts. Not sure if you should test something or not? Use the marginal improvement calculation to determine the difference in risk between launching a feature or user experience without testing versus with testing. Automatically identifies parameters for optimal ROI! 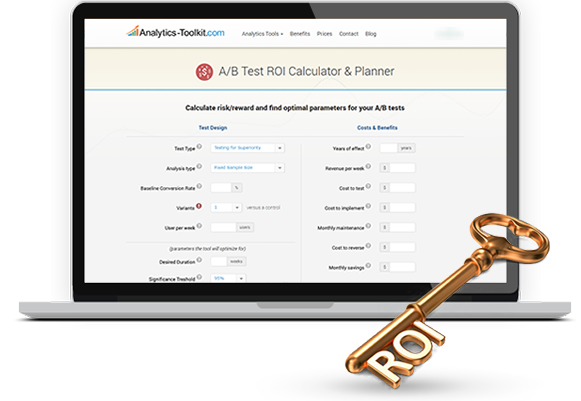 How to use the A/B testing ROI calculator? Enter data for your A/B test: information regarding the statistical design, such as the number of users the site gets, the test monitoring type, the number of weeks you want to run the test for and the desired significance level. Also enter costs/benefits related data such as how much revenue the thing you are testing impacts per week, roughly how much does it cost you to prepare and run the test, how many years do you expect the tested variant(s) to maintain operational, etc. Finally, a probability expressing the expected range and likelihood of different true lift levels should be defined. The calculator will then calculate risk/reward ratios for different scenarios and present a final probability-adjusted (risk-adjusted) ratio of costs and benefits. It also computes the marginal improvement to the risk/reward ratio you get from A/B testing, compared to launching the feature or UX change without any testing. Finally, our optimizer suggests optimal parameters in terms of test duration and significance threshold, for which you will get the best balance between costs and benefits from testing.